Fuel shortages in Gaza have again aggravated after Israel halted supplies from April 10-15, following a Palestinian militant attack at Nahal Oz. Though it resumed supplies on April 16, diesel and petrol supply still remain suspended. Recurring fuel cuts in Gaza--which is entirely dependent on Israel for fuel --are causing daily power outages, disruption of basic services, including water supply, sewage treatment and healthcare services. Since October 28, 2007, following a decision to declare the Hamas government a 'hostile entity', Israel reduced fuel supply to Gaza. Though the move was condemned by human rights activists, in January 2008, the Israel High Court of Justice authorized the fuel cuts. 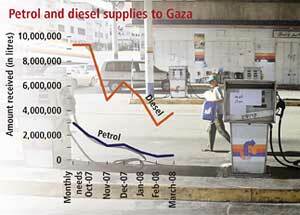 Since then there has been a steady decline in the amount of fuel allowed to enter Gaza.